The New York Central and subsequently the Penn Central built these steel transfer type cabooses in their Despatch Car Shops located in East Rochester, N.Y. This particular car was built in 1969 after the New York Central merged with the Pennsylvania Railroad to form Penn Central. This was the second class of transfer “hacks” built by the NYC/PC. Built with large platforms on either end for increased visibility, these cabooses were used in local switching and transfer freights. The car was equipped with a toilet, a water tank, a conductor’s desk at one end, and a single bunk. The N-11 class was constructed at Despatch Shops between 1969 and the end of operations in 1970. While the car body is similar to the earlier N-6 and N-9 transfer cabooses, the end platforms and truck centers are shorter. A total of 150 cars were constructed, with 75 designated as class N-11e. 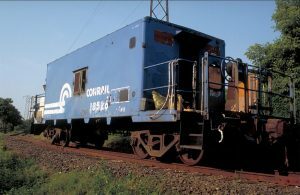 The car was donated by Conrail to the museum in January 1996. The car suffered some cosmetic damage to the opposite side than shown above when it was involved in a roll-over near Batavia, N.Y., which the museum has since corrected prior to its cosmetic restoration. 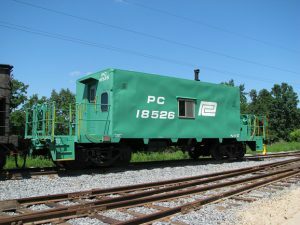 The car is equipped with roller bearing trucks and modern brakes making it the most “modern” caboose in the R&GV Railroad caboose roster. The car is completely restored inside and out. Repainting to Penn Central “Deepwater Green” was achieved during the summer of 2002. This caboose is in regular operation, which you can ride on your next visit to our museum.